Review your artwork proof thoroughly. It is the client's responsibility to ensure spelling and grammar is correct. If a proof containing errors is approved by the client, the client is responsible for payment of all original costs, and any costs involved to correct and reprint. Colors represented on screen may vary slightly from actual print. Size and placement of print is approximate. Once your artwork is approved for production, either verbally in person, by phone, email, or through social media, we cannot guarantee further changes. 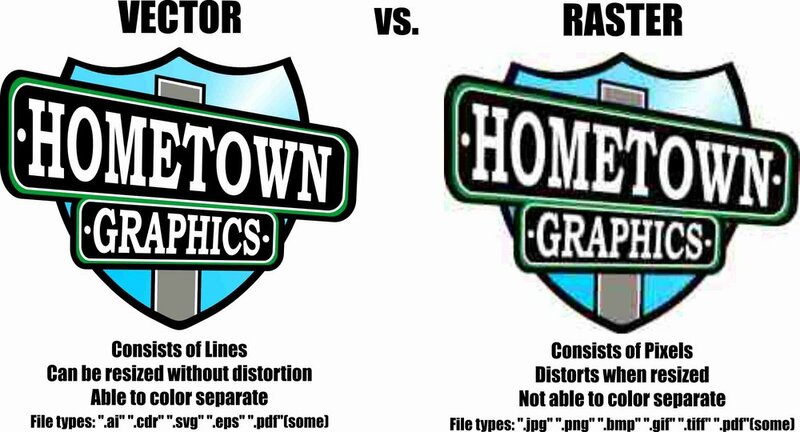 This agreement releases Hometown Graphics LLC from any associated liability. We unequivocally adhere to Copyright & Trademark laws. The client agrees to not include any text, image, design, trademark, service mark, or any copyrighted work of any third party in their products/designs unless they have obtained the appropriate authorizations from the owners. The client warrants that their products/designs do not infringe upon any rights of any third party, including copyright, trademark, right of publicity or privacy, and will not libel or defame any third party, and that they have all required rights or permissions necessary to incorporate third party material into their products/designs. Any artwork found to violate a governing copyright or trademark law without expressed permission will be refused. By placing an order with us, you (the client) warrant that you have all necessary permission, right and authority to place the order and you authorize us to produce the products on your behalf. You grant us the right to copy, modify, distribute, use, create derivative works of and vectorize any of your content for the purpose of fulfilling your order and/or marketing products or services to you. Moreover, you warrant that you have sufficient rights to permit us to copy, distribute, use, modify, create derivative works of and vectorize any of your content for the purpose of fulfilling your order and/or marketing products or services to you. We reserve the right to refuse any artwork containing rude, offensive, unlawful, legelous, obscene, malicious, or profane content. We know you want a quality product with a clean, sharp imprint. The finished product can only be as good as the artwork provided. In an effort to produce your order, we need your help in adhering to our art requirements. In the event suitable artwork is not received, our art department may assess additional art fees. FREE delivery on orders greater than $499 before tax. Delivery encompasses a 15 mile radius of Hometown Graphics. For clients requesting delivery beyond 15 miles please contact us for a quote. Delivery schedule (date and time) is estimated and cannot be guaranteed. In the event of a deadline, we strongly encourage our clients to pick up their order. Once an order is complete, and the client is notified, it is the client’s responsibility to ensure their order reaches them in time. An adult signature is required on all deliveries. FREE delivery to Eudora businesses, schools, churches, and other organizations on all orders. To be considered, you must possess a valid business or other entity license (such as a 501(c) tax exemption) from the state of Kansas and delivery must occur at a business/commercial address. Residential addresses are not valid for free Eudora delivery unless over $499 before tax. Delivery schedule (date and time) is estimated and cannot be guaranteed. In the event of a deadline, we strongly encourage our clients to pick up their order. Once an order is complete, and the client is notified, it is the client’s responsibility to ensure their order reaches them in time. An adult signature is required on all deliveries. $9.99 flat rate for delivery on orders less than $499 before tax. Delivery encompasses a 15 mile radius of Hometown Graphics. For clients requesting delivery beyond 15 miles please contact us for a quote. Delivery schedule (date and time) is estimated and cannot be guaranteed. In the event of a deadline, we strongly encourage our clients to pick up their order. Once an order is complete, and the client is notified, it is the client’s responsibility to ensure their order reaches them in time. An adult signature is required on all deliveries. We do not offer free shipping at this time. All orders are intended for local distribution. Client’s requesting shipping will require a custom quote. Unless otherwise stated, a deposit of at least 50% is required on all orders before production will begin. A $25.50 fee will be assessed for all chargebacks, including returned checks for insufficient funds. Hometown Graphics LLC is not responsible for unfulfilled orders due to failed transactions or chargebacks. Unpaid Invoices: 5% interest of the original invoice amount is assessed every month exceeding 90 days following the unpaid invoice's original due date. It is the client's responsibility to ensure prompt payment. In the event of an unpaid invoice, Hometown Graphics LLC reserves the right to engage a collection agency. All orders are not returnable and non-refundable, including individual orders taken through custom order pages within the Hometown Graphics LLC website. We strive for 100% customer satisfaction. If for any reason you are not satisfied with your order, please contact us at 785-542-0516 or email us at Info@HometownGraphics.com. In the event of an order cancellation, a 20% restock fee will be assessed on the retail cost of all items being cancelled. This is to recover costs incurred for procuring the products (shipping, handling, and other warehouse fees). The client is still responsible for payment even if an entire order has been cancelled. Rush Fee - A minimum fee of $25 may be assessed on all orders that require a turnaround of 3 business days or less. This fee may be assessed more than once on a single order. Rush orders are subject to availability and cannot be guaranteed.